Our beloved Prophet (صلى الله عليه وسلم) travelled from the Ka’aba to Masjid Al Aqsa in Jerusalem (the ‘Isra’), and then ascended from Masjid Al Aqsa to the seven heavens (the Miraj). Read on to discover the happiness lessons from this amazing journey! This blessed and miraculous event occurred about one year before hijrah, 620 A.D. Scholars do not agree about the exact date, but many believe it was on the 27th day of Rajab. 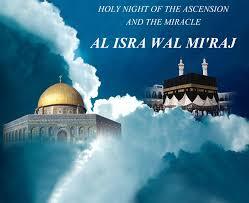 Qur’anic references to Isra wal Miraj are found in the first verse of Surah Al Isra as well as in Surah Najm. This blessed journey was a gift to the Prophet (صلى الله عليه وسلم) directly from Allah (سُبْحَانَهُ وَ تَعَالَى). In the above verse, Allah (سُبْحَانَهُ وَ تَعَالَى) refers to the Prophet (صلى الله عليه وسلم) as “His Servant”. Shaikh Yasir Qadhi, in an excellent Youtube video explains that the title of servant is a title of the highest honour, given to the best of creation, the Prophet Muhammad (صلى الله عليه وسلم). The highest title of honour is that of “Servant of Allah.” Real honor comes from being a servant of Allah. At the time of our Prophet’s (صلى الله عليه وسلم) miraculous journey, he had just experienced the ‘year of sorrow’. In this previous year, he experienced the death of his beloved Khadijah (رضي الله عنها), the death of his dear uncle Abu Talib, and the cruel rejection of the people of Taif. Therefore, the gift of Isra wal Miraj was our Prophet’s ease after hardship. Expect Allah (سُبْحَانَهُ وَ تَعَالَى) to grant you ease when you face hardships. Allah (سُبْحَانَهُ وَ تَعَالَى) will reward your patience. In the beginning, Angel Jibreel (عليه السلام) came to the Prophet’s (صلى الله عليه وسلم) home and took him to the circle around the Ka’aba. Jibreel then gave the Prophet (صلى الله عليه وسلم) a bowl of iman or zamzam water (according to different ahadith) and then took out the Prophet’s heart and cleaned it. Then Jibreel brought the Prophet (صلى الله عليه وسلم) an animal called Al Burraaq, which was smaller than a mule and larger than a donkey. Each hoof of Al Burraaq could reach as far as the eye could see. Then the Prophet rode Buraq to Masjid Al Aqsa and he tied Al Burraaq to an animal post used by all the Prophets. Then the Prophet went inside the masjid and prayed two rakahs of the Tahiyatul-Masjid prayer. The Prophet(صلى الله عليه وسلم) saw Prophets Musa, Isa and Ibrahim all praying already. Next, Prophet Muhammad (صلى الله عليه وسلم) led all of the prophets in prayer; he was their Imam. The Prophet Muhammad (صلى الله عليه وسلم) was given the greatest honour of being the Imam of all prophets. We are truly blessed to be in his ummah! Then the “doors of the sky” opened for the Prophet (صلى الله عليه وسلم), and this was the beginning of his ascent (miraj) from Jerusalem. Jibreel would say “Yes” and then the doors of each heaven would open up. In the fourth heaven, the Prophet (صلى الله عليه وسلم) saw Prophet Idris (عليه السلام) and the same greetings were said. In the fifth heaven, the Prophet (صلى الله عليه وسلم) saw Prophet Harun (عليه السلام) and the same greetings were said. Your worship of Allah on Earth will be seen in Heaven. Next, the Prophet (صلى الله عليه وسلم) went above the seven skies and saw Sidratul Muntaha, the lote tree at the very end of the seventh heaven. It is the boundary beyond which creation is not allowed to pass. The Sidratul Muntaha has long branches and a fruit with a sweet scent and luscious, sweet taste. The fruit is as large as the “jugs of Hajar” and its leaves are like the ears of elephants. Colours cover the tree and the Prophet (صلى الله عليه وسلم) said, “I don’t know what those colors are.” Golden butterflies surround this tree. This tree was the last thing that the Prophet (صلى الله عليه وسلم) saw before he came to the presence of Allah (سُبْحَانَهُ وَ تَعَالَى). This tree is referred to as Ayatul Kubra in the Holy Quran and it is one of the most magnificent creations of Allah (سُبْحَانَهُ وَ تَعَالَى). Below this tree are four rivers flowing. Two are hidden and two are visible. The two visible rivers are the Nile and Euphrates, which are blessed rivers even in our world. The two hidden rivers are seen only in Jannah: Al Kawthar and Salsabil. Have hope in the beauties of the next world that await you! The Prophet (صلى الله عليه وسلم) also saw Angel Jibreel in his original form. Jibreel has 600 wings that block the horizon, with pearls and corals dripping from his feathers. 3. the promise that whoever from his ummah worships Allah (سُبْحَانَهُ وَ تَعَالَى) without committing shirk will be forgiven. HAPPINESS HINT: In a hadith recorded in Sahih Muslim, whoever recites the last 2 verses of surah Al-Baqarah on a nightly basis, then “that is enough” (i.e. he doesn’t need anything else). These two verses were received directly from Allah (swt) to help protect us from shaytan. Let us try to recite them every night, in shaa Allah. The five daily prayers were decreed on Prophet Muhammad (صلى الله عليه وسلم) while he was in the Divine Presence of Allah (سُبْحَانَهُ وَ تَعَالَى). This shows the high importance of the 5 daily prayers. The salat were decreed directly by Allah (سُبْحَانَهُ وَ تَعَالَى) to the Prophet (صلى الله عليه وسلم). Please never neglect your five daily salat! The story of how the salah was decreed shows the mercy of Allah (سُبْحَانَهُ وَ تَعَالَى). It shows that He does not want to make life difficult for us. It shows that Allah (سُبْحَانَهُ وَ تَعَالَى) listens to His servants. This story also shows that we were created for one purpose: to worship Allah (سُبْحَانَهُ وَ تَعَالَى). We should be praying to Allah (سُبْحَانَهُ وَ تَعَالَى) as much as possible. After the meeting with Allah (سُبْحَانَهُ وَ تَعَالَى), the Prophet (صلى الله عليه وسلم) saw heaven and hell. HAPPINESS LESSON: The hardships of this world are nothing compared to the punishments of the next world for oppressors. Have hope in the justice of Allah (سُبْحَانَهُ وَ تَعَالَى). The Prophet ﷺ said that he saw the punishment of one who stole the orphan’s money. They had noses like that of camels (disfigured) and they would be eating coals made out of fire and their mouths would swallow these coals, which would come out from their anuses. He ﷺ also saw people who had nails of copper and they were scratching their faces with them. These were the people who used to backbite all the time. HAPPINESS LESSON: We must never backbite or gossip about other people. This is a great sin that will lead to much suffering. He ﷺ saw people who had in front of them pure meat and then rotten infested meat and they were eating the rotten meat. These are the people who used to fornicate and commit adultery. He ﷺ also saw people with such large bellies that they could not stand up and animals were being brought to trample over them. These are the people who would get their money from riba (interest). He ﷺ saw people who were cutting their own lips and tongues with scissors of copper and scissors of punishment and fire. These are the people who would tell others to do good and they would forget to do good themselves. He ﷺ also saw the dajjal and said that one of the dajjal’s eyes was bloated and his left eye is like a rotten grape. Then the Prophet ﷺ came back down to Jerusalem on the Buraq. He ﷺ rode the Buraq back to Medina and passed by 3 caravans of the Quraysh that he recognised and he saw a man looking for a camel he had lost. When he returned to Makkah he ﷺ went back to sleep and woke up in Masjid Al-Haram. As I was sitting anxious and nervous and worried, the enemy of Allah (سُبْحَانَهُ وَ تَعَالَى), Abu Jahl passed by me and he saw me in that state. Abu Jahl said to me in a sarcastic manner, ‘What is the matter with you?’ I said, ‘Yes something happened last night. I was taken from here to Jerusalem.’ Abu Jahl asked, ‘If I call your people, will you tell them exactly what you told me?’ and I said yes. He called the people of Makkah and said, ‘Tell them what you promised you would tell them.’ So I told them about Jerusalem and Masjid Al Aqsa at Baytil Maqdis. People began reacting in different ways. Some were clapping their hands and snickering and laughing. HAPPINESS LESSON: This story shows us the humanity of our beloved Prophet ﷺ. When he ﷺ woke up in Makkah, he ﷺ was anxious. We see his ups and downs, his joys and sorrows. Even the Prophets had emotional ups and downs. We must accept our emotional ups and downs as a normal part of life. “The first is so and so, the second is so and so and the third has an urn of water.” Abu Jahl said, “If this is true, then they should be entering Makkah.” The Prophet’s words turned out to be true. The purpose of Isra wal Miraj was to show our Nabi ﷺ his high status and to console him after all of his hardships. It was a personal gift to our Prophet ﷺ from Allah رضي الله عنه . When you are feeling down, doesn’t it cheer you up more when someone surprises you? 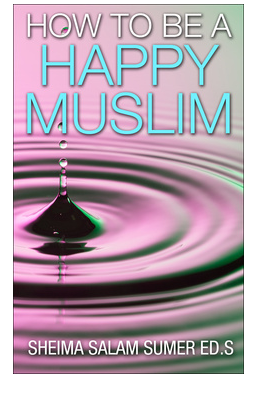 HAPPINESS LESSON: Even the Prophets of Allah needed an imaan (faith) boost. So don’t be hard on yourself if you sometimes feel spiritually low. The greater the difficulty, the greater the ease if we remain firm and faithful. The great Islamic scholar Ibn Katheer said that if any person saw a fraction of these miracles, he would have woken up a madman. This shows us the imaan, courage and bravery of our Nabi ﷺ.